The Belmont men’s basketball team completed the Battle of the Boulevard sweep on Tuesday night, beating Lipscomb 76-74 in the closest game the Bruins have played all season. After losing both games against Lipscomb in 2017, the Bruins beat the Bisons in the two teams’ first matchup of 2018 in November. The Bruins headed into Tuesday’s game with a record of 6-1, their best start to a season in the team’s Division I era. Lipscomb was also coming off major wins against Texas Christian University — which was ranked No. 18 in the nation at the time — and MTSU. Belmont freshman Nick Muszynski had another incredible game, earning a double-double with 19 points, 11 rebounds and four blocks. Senior Dylan Windler broke out in the second half, scoring 10 points and 12 overall. Junior Michael Benkert scored his season high with 12 points. The rival teams battled back and forth throughout the first half, but Lipscomb took advantage of Belmont’s missed shots and took the lead early, ending the half with a lead of 35-33. The Bruins came out shooting at the start of the second half, going on an 8-2 run to kick it off. But that wasn’t enough to hold Lipscomb at bay, as the Bisons kept the score within reach and tied it up at 74-74 with 32 seconds left. Lipscomb senior Rob Marberry scored 22 points in the second half alone to help keep the Bisons in the game till the last shot. With 5 seconds left on the clock, freshman Caleb Hollander scored what would be the game winning layup. 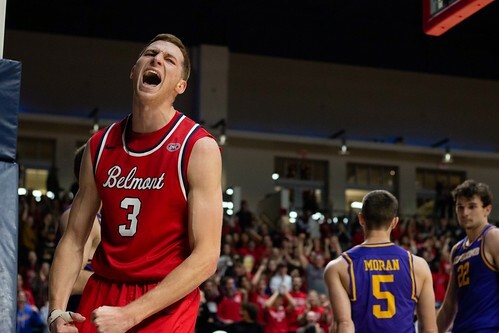 Belmont’s defense forced a missed 3-pointer from Lipscomb to give the Bruins the win. “It was extremely hard fought, and it felt like a chess match,” said Belmont head coach Rick Byrd.